The main attraction of North Ladoga is a group of rocky islands, lined with solid granites and diabases, which emerge in the north-western part of the lake. 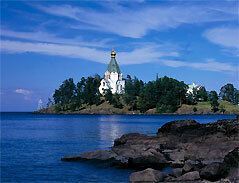 The Valaam archipelago consists of 50 islands, the largest of which is Valaam Island, located 22 km from the mainland. The distance to the nearest Karelian town, Sortavala, is 42 km, to St. Petersburg more than 220 km. Steep cliffs, meeting the mighty waves of Ladoga, and the quiet tranquility of internal lakes, relict spruce and pine trees, the beauty of lanes and gardens, the combination of pristine nature and the originality of the architecture - all this makes Valaam one of the most beautiful islands in the world. The white nights on Valaam, when the sun doesn't set at all during the night and the shortest of which lasts 3 hours 45 minutes, are surprisingly poetical. Gaze at the dark outlines of trees and chapels on the bright face of the sky and the surface of the Gulf as if it were made of silver. The name Valaam, comes from the Finno-Ugric word “Valaamo” - a high, mountainous land. Monks found the name also attuned to the Biblical prophet’s name, and they named the island Valaam after him. The Valaam archipelago has a rare and spectacular natural beauty. Steep cliffs, peaks, valleys, plateaus remind us of the highlands. Monks did not cut down the forest trees on the island, but only used those felled by the wind. Therefore, Valaam is covered with virgin taiga. Some trees are over 300 years old. A story has been told about the maple tree that according to legend was planted by abbot Damascus of the Valaam monastery next to his "hermitage" in 1855. In 1985 it dried out, and in 1986 a new maple tree was planted in its place to keep the tradition. The island is famous for its architectural ensemble of The Spaso-Preobrazhensky (Holy Transfiguration of the Saviour) Monastery, which has existed since the 14th century. For centuries, when the monastery was the sole owner of the island, Valaam became a single landscape and architectural complex. Churches, chapels, monasteries, and skits (hermitages) were erected along with the monastery facilities. For all Orthodox believers Valaam is inconceivable without its ancient monastic cloister, which for centuries was the spiritual center of Orthodox Russia and rightfully called the Northern Athos. Spaso-Preobrazhensky (Transfiguration of the Saviour) Cathedral, Uspenskaya Church (Church of the Assumption), the guest-house, stables and the well house, as well as the buildings of the White and Red Monasteries all remain intact. 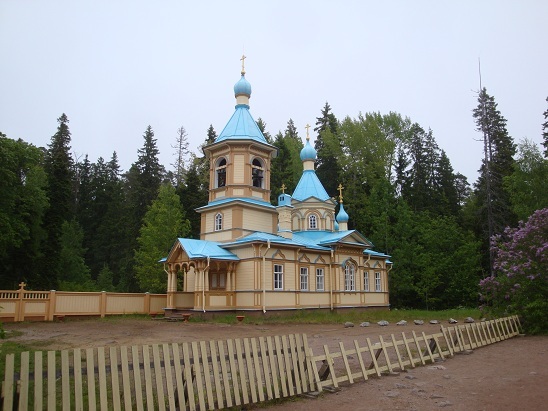 The story of Christianity on the island of Valaam is rooted in the distant past. According to the legend, Apostle Andrew, visiting Scythian and Slavic lands in the 1st century, travelled the waterway from Novgorod to Valaam, where he destroyed pagan temples of the local tribes and erected a cross on the wild cliffs. In the nine centuries before the Baptism of Russia, the monks from "Eastern Countries" came to Valaam, among them the first holy wonderworking monks - Sergius and Herman of Valaam who followed in the path of Apostle Andrew. By their prayers and efforts the monastery in honour of the Transfiguration of the Saviour of the Lord was founded. It nurtured many famous canonized devotees. 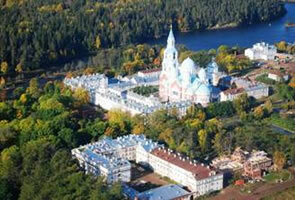 Life at Valaam Monastery has always been akin to an epic. The monastery was repeatedly attacked and ruined. However, the Valaam monks, following the Lord's command, have never taken arms in hand, condemning themselves to exile or taking a martyr's death. At the beginning of the 16th century, the monastery was completely destroyed, and the Valaam land was annexed by Sweden for 100 years. At the end of the Great Northern War the monastery was revived, reaching its peak in the middle of the 19th century. Most of the monuments of this time survived. Due to the diligence of Valaam’s monks under the supervision of Abbot Damascus, monasteries, churches, chapels, and roads were rebuilt, and praying crosses erected. The main theme of monks’ lives was their prayers. The strict Charter of Valaam Monastery, introduced at the end of the 18th century by abbot Nazar, was based on the Charter of Sarov and defined all aspects of monastic life. A monk was supposed to keep physical and mental silence, forbidden to keep any of the donations to himself, forbidden to drink alcohol, to leave the monastery, or to have any correspondence without the blessing of the abbot. The Charter envisaged cohabitation, hermitage and reclusive forms of monastic life. At the beginning of the 20th century Valaam Monastery included 13 skits (hermitages) located on different parts of Valaam and on other islands of Ladoga. Unfortunately, many buildings have not survived to our time. 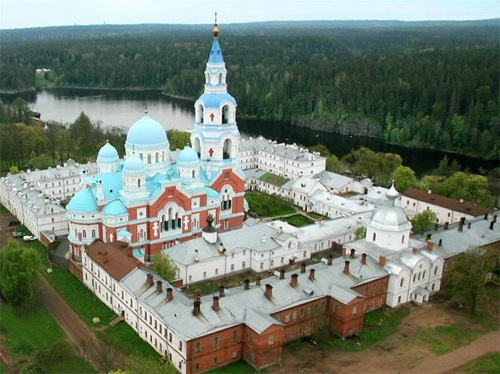 The fame of the high spiritual life of the monastery, the amazing nature of the island, and the beauty and rigor of monastic worship attracted many pilgrims to Valaam. It was visited by Emperors Alexander I and Alexander II, members of the imperial family, and famous scientists, artists, writers, and musicians. From 1811 to 1917 the archipelago was part of the Princedom of Finland of the Russian Empire. After the 1917 revolution Valaam was a part of the territory of a newly independent state - Finland. This saved the monastery from the fate of many Russian monasteries, and it continued to be almost the only surviving wonder of the holy area of Russia. 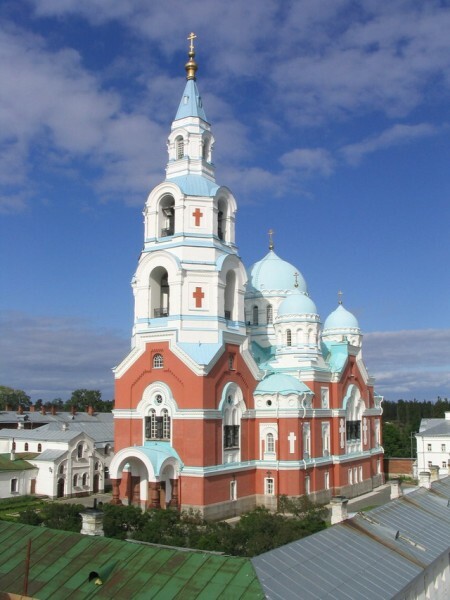 However, in February 1940, after the end of the Soviet-Finnish war when Valaam had to be returned to the Soviet Union, the monastery monks were forced to evacuate to Finland to escape from persecution by the authorities. The empty school buildings were occupied by the Schools of Boatswains and Cabin Boys, and later were turned into nursing houses for the disabled. Only half a century later, in December 1989, on the eve of the feast of St. Andrew, has monastic life returned to Valaam.